While I’m 100% anti-prohibition, I suppose I’m also anti-illegal activity. Things come to a head between these two forces when Elliot Ness and his Untouchables enter into a full-scale gunfight with mobster Al Capone and his cronies, inside Chicago’s Union Station. Members of both factions are blown away by various weapons and upping the tension factor is the fact that a mother and her young child (in stroller) are caught in the crossfire. To bring the reverse heisters back to the real world, a serious jolt is needed… like the type you get when you feel you’re falling in a dream. To achieve this, the crew decides that their vehicle needs to fall from a bridge into the water below. Because time moves differently in the various levels of consciousness, this descent is painfully slow and also affects the members caught in the different dream levels, throwing them into the ceiling or other obstacles of the realm they are in. Let’s move on to a lighter scene. In this teen comedy, high school senior Brad Hamilton watches his sister’s friend swim in the family pool and fantasizes about her slowly emerging from the water and dropping her bikini top all for his pleasure. This causes Brad (played by Judge Reinhold) to need some “release”… thankfully not also done in slow-mo. As we’ll find with many of these scenes, music plays a large role in the full effect, this time with the Cars ‘Moving in Stereo’ providing the soundtrack. This scene instantly made the character of Quicksilver popular with fans who didn’t know he even existed and demand to have him included in future X-men installments was passionate. Watching the young mutant run around the vault as time crawled to a halt, messing with guards and repositioning bullets was very entertaining. Only slow time will tell what other adventures Quicksilver gets up to in the future… and past! While I’m not a fan of the Matrix franchise, I have to admit that there are many great slow-mo scenes throughout the trilogy. Bullet Time, for example, was a jaw-dropping and revolutionary filming technique and similar processes were used for other fight scenes, such as the lobby shootout in the first installment and Neo’s battle with an unlimited number of Mr. Smiths in the sequel. I still don’t understand the damn thing, though. Perfectly combined with Metallica’s ‘For Whom the Bell Tolls’, this may be one of cinema’s greatest opening montages. In just a few brief scenes, the audiences is caught up to speed with the horrors of the apocalyptic zombie outbreak that has forced our hero from his cozy, shut-in life into a world of fear, mistrust, and always being vigilant. We even see a bride attack her new husband, which would have to make their nuptials the wedding of the year! With the Channel 4 news crew reunited and en route to new jobs for the launch of a 24-hour channel, all the guys have to do is survive a cross-country road trip aboard an RV driven by Ron Burgundy… who doesn’t really understand the concept of cruise control. This results in their RV swerving off the road and injuries to each journalist, including deep fryer oil to the face, a bowling ball to the skull, an even a scorpion attack. Why these items were ever aboard the RV remains an unsolved mystery. Almost all of us have been there: frustrated with a printer or other office device. These three disgruntled employees decide to take their venom out on the machine that has caused them the most angst, bringing it out into a desolate field and destroying it. With the song ‘Still’ by the Geto Boys fueling their destructive intentions, the trio makes the device unrecognizable, even going so far as to wield a baseball bat in their attack. Every office worker has dreamed of doing the same ever since! To cheer up their buddy Derek Zoolander, the male models go out for some Orange Mocha Frappuccinos. As they stop to fill up their Jeep with some gas, they decide to have a playful fight with the fuel and all is well until one of the models lights a cigarette, causing the station to explode into a ball of fire. Once again, the music selection is key here, as the Wham! Classic ‘Wake Me Up Before You Go-Go’ deceives the audience of the tragedy that is about to unfold. The Chariots of Fire scene should really be included, given how many times it’s been parodied. There’s also an amazing scene in Ace Ventura where Jim Carrey performs a football play in both slow-mo and rewind. Courtenay Cox can barely keep a straight face throughout! These two famous overachieving potheads took their stand-up comedy routine and turned it into numerous movies and albums, working together off and on for over 30 years. 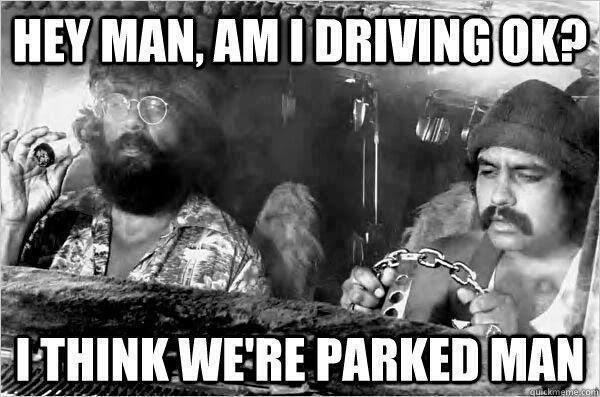 They are responsible for a number of famous catchphrases, most notably “Dave’s not here, man.” Not only do these two play fictional stoners, but one of them also plays the role in real life. Tommy Chong was sent to prison in October 2003 for selling bongs and other paraphernalia over the internet. This incarceration occurred while he was a cast member of That 70’s Show, playing, you guessed it: a hippie burnout named Leo Chingwake. First off, let me say that the pants James Franco wears for the duration of this film are, quite possibly, the greatest wardrobe choice in the history of film. If someone were to ever bequeath these to me, I would honour them with their own special holiday. Dale (Seth Rogen) and Saul (Franco) get stuck in a hilarious set of circumstances thanks to their enjoyment of Pineapple Express, an extremely potent brand of marijuana. Their dealer, Red, (Danny McBride) also joins in on the fun and the three have to triumph over a oppressive drug kingpin. It’s so hard to believe that this character was played by Sean Penn, given all the serious roles Penn has since gone on to play. Spicoli, a laid back, pot smoking, surfer dude, became so popular that he’s featured on the cover of the movie, despite being a tertiary character. One of the subplots of the movie is teacher Mr. Hand trying to get the best he can out of Spicoli. When Mr. Hand thinks he’s achieved results, he releases Spicoli but eventually comes to the conclusion that everyone at the school is “on dope”. Spicoli meanwhile goes on to save a drowning Brooke Shields, but wastes the reward money hiring Van Halen to perform at his birthday party… sounds about right. One of the most enjoyable running gags on That 70’s Show was ‘The Circle’, where any number of the group’s members – Eric, Hyde, Kelso, Fez, Donna, Jackie and any number of their friends – would wax philosophically after enjoying some marijuana, as the camera rotated around the table. Some of the shows funniest lines came out of these scenes. One memorable segment included the kids’ parents sitting in the circle, high from “special” brownies and mimicking their children’s actions. While not the biggest stoners per se, these two gentlemen enjoy their weed. Their zany adventures to White Castle, from Guantanamo Bay and attempting to save Christmas were often fuelled by the drug in some way. A highlight of all the movies is the performance of Neil Patrick Harris (playing himself), which practically revived his career. In the films, NPH is an even bigger drug user than Rolly and Kumar, who can definitely hold their own. 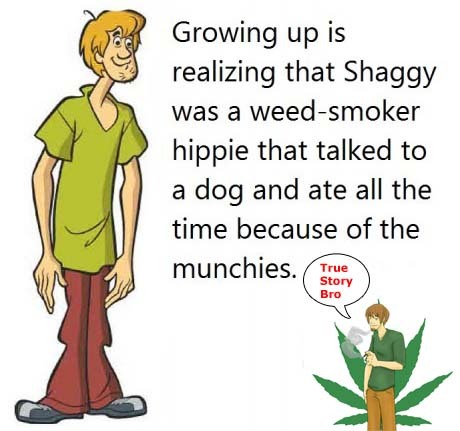 Although the show never quite comes out and says it, let’s look at the evidence: 1) Shaggy’s constantly searching for munchies 2) his attention span is minimal at best 3) his nerves are always shot and he appears strung out 4) he has conversations and hangs out with a dog… conclusion: Shaggy is your typical pothead. Still, Shaggy is one of the most beloved characters in the history of media, especially when paired with his pal Scooby. The two have teamed together for countless adventures, highlighted by my personal favourite, Scooby-Doo Meets the Boo Brothers. While Dave Chappelle himself was disappointed with how the movie turned out – he wrote the script and starred, but said the movie was dumbed down from being adult-oriented to more of a kids movie – there are still a number of funny moments in this film. Some favourites are when Thurgood describes the different types of pot users, particularly the Scavenger Smoker (Snoop Dogg), who comes into the scene at the first sniff of marijuana and proceeds to smoke the guy’s entire joint before moving on. The scene where Scarface quits his job at the fast food restaurant is also a highlight. It’s hard not to notice that stoners in films often come in pairs or trios (whereas alcoholics are always portrayed as miserable loners, hmmm…). Jay and Silent Bob seem to always pop up in Kevin Smith’s View Askewniverse, and why not? Silent Bob is played by Smith. The duo’s notorious appearances in movies they weren’t the star in led to their own title adventure where they’re on a mission to shut down a movie based on their personas. The pair offer a great lesson too: if you have one loud mouth who never shuts up, then his buddy better be silent to help restore the balance. 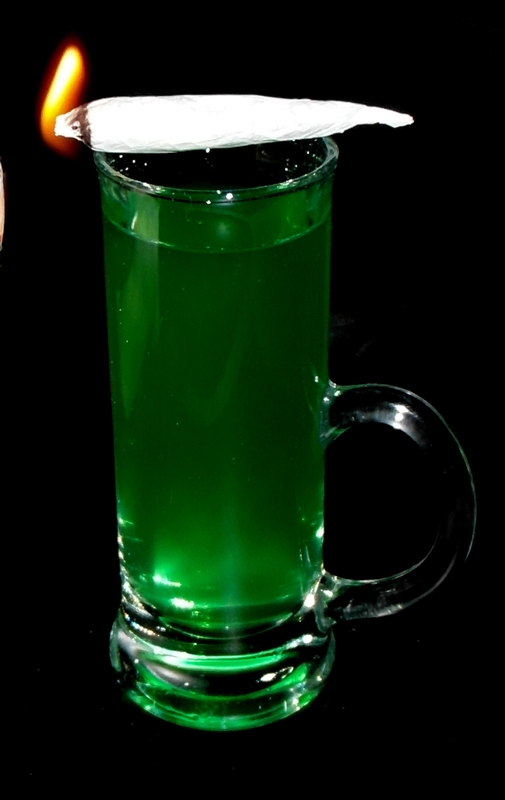 As we down this shooter, I wish all my pothead brethren a very happy 4/20… enjoy your day! This shot was sweet, but not overly so. It goes down nice and easy, but isn’t very exciting. Despite all the ingredients it’s relatively effortless to make. It’s not like you have to do layering or anything. Give it a shot (literally!) and see what you think.